Today I'm featuring my current read, The Trophy Child by Paula Daly. The excerpts shared are from a hardcover edition borrowed from the library. The girls' changing room smelled heavily of sweat, mud and a sickly-sweet deodorant that was beginning to irritate the back of her throat. She didn't have a lot of enthusiasm for hockey. Not a lot of enthusiasm for school, full stop, now that she was on a probationary period. Page 56: "Jennifer couldn't respond, just quaked hard in her chair, her knees lifting with what Verity knew was excitement at seeing her daughter." My thoughts: Paula Daly is a keen observer of contemporary marriage and family life. As with two of her previous novels that I read—Just What Kind of Mother are You? and Keep Your Friends Close—readers are drawn into mysterious circumstances and unexpected twists while uncovering the troubled relationships between neighbors, spouses, parents, and children. Daly's characters are complex and relatable, and her strong plots move the stories along at a good pace. The Trophy Child follows this same winning formula. I am savoring the story and hope the author will be treating readers to another novel soon. Paula Daly is acclaimed for her distinctive voice, masterful plotting, and terrifying depictions of ordinary people whose everyday lives are turned upside down through deception and murder. 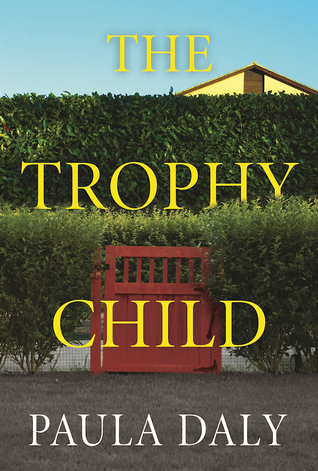 In her unsettling new domestic thriller, The Trophy Child, Daly digs beneath the serene surface of the idyllic suburban Lake District community where families strive for perfection, delivering a suspenseful, surprising story of motherhood and fallibility. Karen Bloom is not the coddling mother type. She believes in raising her children for success. Some in the neighborhood call her assertive, others say she’s driven, but in gossiping circles she’s known as "the tiger mother." Karen believes that tough discipline is the true art of parenting and that achievement leads to ultimate happiness. She expects her husband and her children to perform at 200 percent—no matter the cost. But in an unending quest for excellence, her seemingly flawless family start to rebel against her. Her husband Noel is a handsome doctor with a proclivity for alcohol and women. Their prodigy daughter, Bronte, is excelling at school, music lessons, dance classes, and yet she longs to run away. Verity, Noel’s teenage daughter from his first marriage, is starting to display aggressive behavior. And Karen’s son from a previous relationship falls deeper into drug use. When tragedy strikes the Blooms, Karen’s carefully constructed facade begins to fall apart—and once the deadly cracks appear, they are impossible to stop. A thrilling tale of ambition and murder, Daly’s richly imagined world of suburban striving and motherly love is an absorbing page-turner about the illusions of perfection and the power games between husband and wife, parent and child.